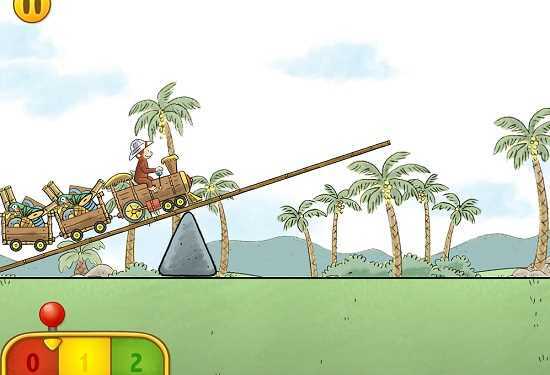 This fun train app teaches simple physics concepts to young children. 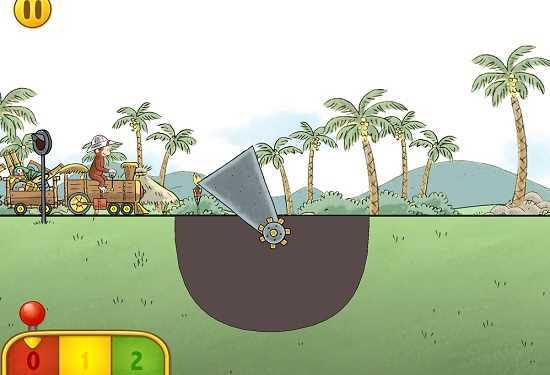 Curious George Train Adventures is a fun science app that lets preschoolers and kindergartners learn physics fundamentals while driving a train along a track full of challenging obstacles. George's train is carrying building supplies for the new amusement park, and kids guide him to his destination. 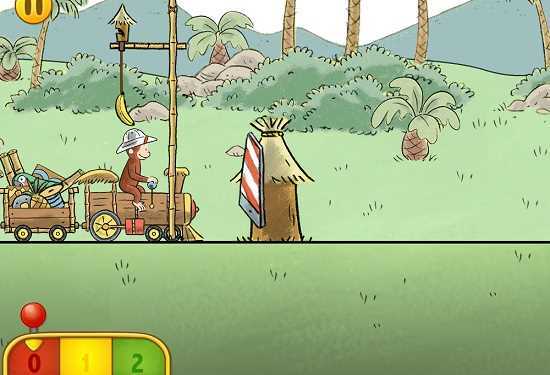 Players must speed up, slow down, and stop the train at the right moments to get George safely past different obstacles. 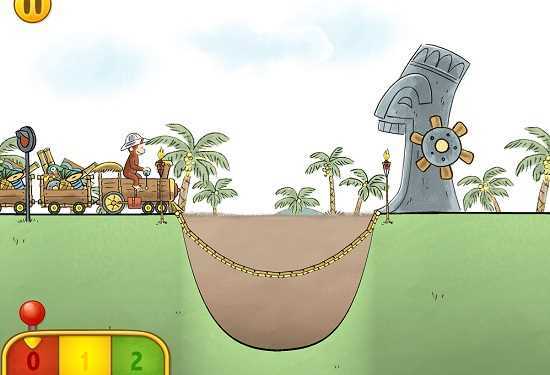 Obstacles start off as simple hills and bumps, but as kids advance through the levels, more challenging obstacles appear that require more advanced problem-solving – such as weight-activated gates, rotating platforms and pulley-powered rope bridges. If the train doesn't travel smoothly through the obstacles, some of the building supplies fall off. Players earn stars at the end of each level based on how many supplies they have left at the end of the run. Kids start with the ability to play the 10 levels of the Tiki-themed section of the amusement park. Additional sections, which include an outer space theme (10 levels), a winter theme (10 levels), and a "Zany" meadows theme (10 levels), can be unlocked for an additional fee ($.99 per theme or $1.99 for all three themes). 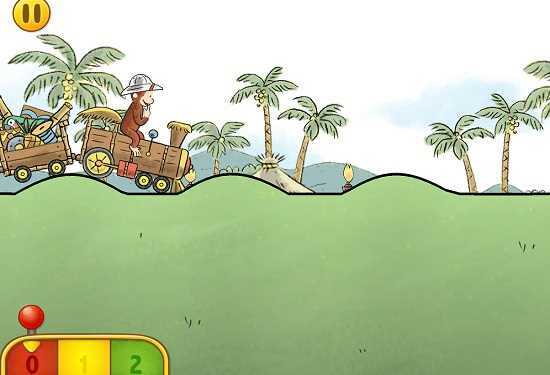 Curious George Train Adventures has good production values and simple, intuitive controls. To move the train, kids simply move their finger along a color-coded slider with three options: stop, go slowly, and go quickly. We like that this enforces the concept that red means "stop," green means "go," and yellow means "slow down." Levels are not timed. Kids are free to learn by trial and error, see how physics causes different objects to interact with each other, and practice what they've learned when they encounter the obstacle again. Kids can also learn perseverance and problem solving, and develop their powers of concentration. Offering only 10 levels at the purchase price of $1.99, the app will soon leave kids wanting more. It doesn't cost much to unlock the rest, however, it feels wrong to add an in-app purchase to a paid app. Either charge $3.99 from the get-go; or give the first 10 levels away for free and then charge to unlock the rest of the app. The developers could also improve Curious George Train Adventures by providing separate player profiles for different users. That would allow households with siblings to set up individual gaming experiences. 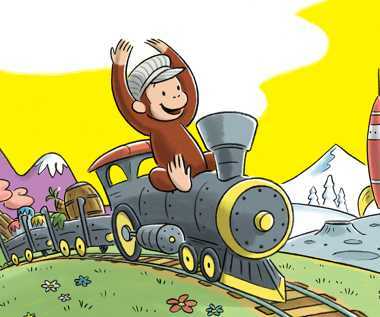 Curious George Train Adventures is a great app for young fans of Curious George. The familiar character entices kids into exploring basic STEM concepts in an engaging and encouraging environment. BONUS CONTENT: If your kids love trains, check out these other apps that all feature choo-choos: Top Train Apps for Kids. This kids app review of Curious George Train Adventures was written by Erin Bell.